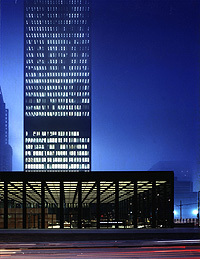 A large cluster of buildings in downtown Toronto, consisting of six towers, covered in bronze-tinted glass and black painted steel. Three structures are arranged on a granite plinth, with the Banking Pavilion anchoring the site at the corner of King and Bay Streets. The buildings are confined to a rigid structural grid set out across the plinth's top, and each is offset to the one next to them by exactly one bay of the grid, allowing views to 'slide' open or closed as one moves through the site. On the north side, within the space created by the situation of the towers and pavilion, a large granite plaza provides a formal entry to the complex. Blurring the distinction between interior and exterior, the granite surface of the plaza extends through the glass lobbies of the towers and through the Banking Pavilion.